Author's note: I will take any excuse to haunt costume shops. Something about the level of detail that these craftspeople put into their work awes me every time. The ants, however, are one of my few photos used to illustrate an article (generally I rely on the pros). Everyone sees a performance slightly differently. Tiny details often overlooked by the audience appear as large as billboards to the creators. 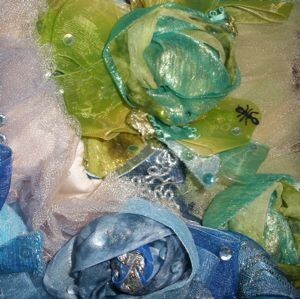 "We had to rush to get the Cinderella costumes ready for TV ad," said Larae Hascall, costume shop manager at Pacific Northwest Ballet. Watching the swirl of red ballgowns surrounding Cinderella and her prince as the ad played on her computer monitor, Hascall noted that the men didn’t have their queues (wigs) ready at the time of filming and her team hadn’t done final fittings on several costumes. "It will look even better on stage." While most of us might not notice the exact fit of a Prince’s jacket, Hascall’s crew knows that tailoring the costumes to fit is essential for the dancers' comfort as well as their good looks. For this outing of Cinderella, nine years in storage also led to many necessary repairs. "The elastic gives out after a certain amount of time," said Hascall, flipping over an elaborate bodice to show the elastic straps used to hook the piece to other parts of the dancer's costume. Besides needing to cut and sew new elastic pieces into every costume, all the elastic has to be dyed to match the originals, so the straps become invisible part of the outfits. Materials hold up better, although certain stretch fabrics might need to replaced. Like the elastic, constant movement and perspiration eventually take their toll on a ballet costume as does time in storage. "Cinderella's dream mother needed work each time we got it out of storage," said Hascall, who has worked at the PNB costume shop since 1983. "The original costume was this beautiful silk that just shredded. Then we replaced that with a stretch that went dead and lost its shape." The shop began working on the Cinderella costumes late last year, while the company was filling the stage with Nutcracker. "We began with the ballroom scene, so they could film the ad, and then went into fittings with the principals in December. When everyone came back January, we finished up the corps and the children," Hascall said. Created in 1994, Cinderella was Broadway and opera costume designer Martin Pakledinaz's first venture into ballet. More than 120 gorgeous costumes were created for the ballet. "Actually, that is quite small for a story ballet," said Hascall. "Sleeping Beauty has more than 200 costumes." Hascall called many of Pakledinaz's choices for costumes "very structural" and unusual for ballet costumes. "There’s some very big costumes in this show, lots of fabric," she noted. "I love the shoe ladies in Act III." While the giant red ballgowns emphasize the fairytale romance, other aspects of the costumes serve choreographer Kent Stowell's humor, she added. "This is a very funny show. The whole silliness of the stepsisters, that’s classic Kent comedy." One very tiny and humorous detail that can’t be seen by the audience are the plastic ants (see photo above). "Somebody brought a bucket of plastic ants into the shop when they were making the costumes. And the guy working on the bodices started hiding an ant in the lace," Hascall said. "It’s a little bit of whimsy." The ants also serve as a charming maker's mark, she added. "People here have a pretty high degree of pride in their work."